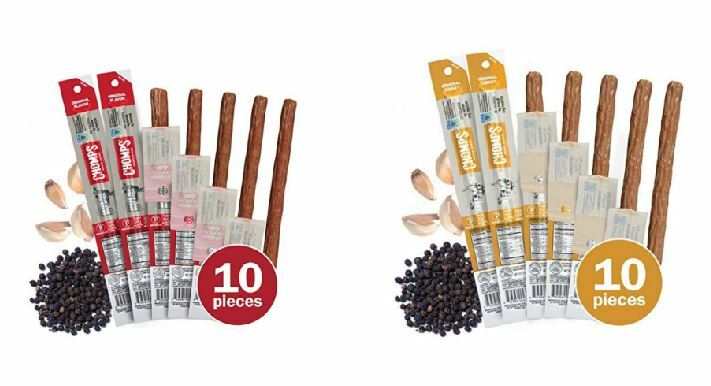 Whole30 — MumbleBee Inc MumbleBee Inc.
Deal of the Day: Save up to 25% on CHOMPS 10 Count Snack Sticks for 9/20/2018 only! Not all jerky is created equal get either CHOMPS beef or turkey jerky 10 count package deal of the day for 9/20/2018 for $14.99 ($1.30 / Ounce) & FREE Shipping on orders over $25 shipped by Amazon. CHOMPS is changing the way you see jerky sticks. By going back to basics, we have created high quality, healthy snacks that you can enjoy at home or on the go. Each one of our products is filled with 10g of protein – a class above most other meat sticks. CHOMPS are made with 100% Grass Fed & Grass Finished or Free-Range, Antibiotic-Free proteins and a handful of ingredients including Non-GMO natural spices.